October 5, 2002. The wide, shallow case has a wrap-around acrylic front, leaving only the back wall and floor to be decorated. Since it's just background for the doll, I'll keep it low-relief and dark tones. You can see I sketched a door with a gothic arch on the right of the back wall. Since my doll looks best facing left, I moved the door to the other side. I changed it to a rounded arch because the pointy one looked too much like a castle. Oct. 7. I'm tearing up cardboard egg carton lids to make the stonework. Here I've used the only two lids I had; fortunately, my supervisor at work uses the cartons as firestarters and gave me half a dozen. That should be enough to do the outside of the case, too. That's a cast-plaster lion's head above the door. The beige thing is from a mini grab bag; I think it's supposed to be a fire board, but it will add texture and interest to the otherwise blank wall. 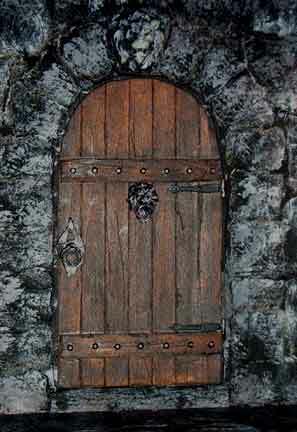 You understand everything except the door will be painted to look like stone, right? Some bits and pieces; the roundish thing is a fake horse brass (actually very brittle pot metal). I'm using the lion's head for a door knocker, and the thick bit at the bottom will support the torch. That's the torch above--it's a golf tee topped with a jewelry finding. It'll look better painted black. The door pull and knocker rings are made of crumpled foil; the pull escutcheon is an old earring, "nail heads" are rhinestones and the hinges are... cast metal hinges. Occasionally you get lucky and find just what you need. All this "wrought iron" has been sprayed with Krylon Ultra Flat black paint and drybrushed sparingly with silver acrylic paint. The door itself is basswood paneling with lots of extra scrapes and nicks to age it. 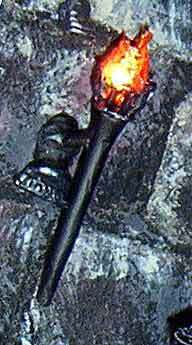 The torch, lit. Flames are orange and yellow cellophane surrounding a 12-v bulb painted orange with stained glass paint.